In August, we posted about jigsaw puzzle swaps. 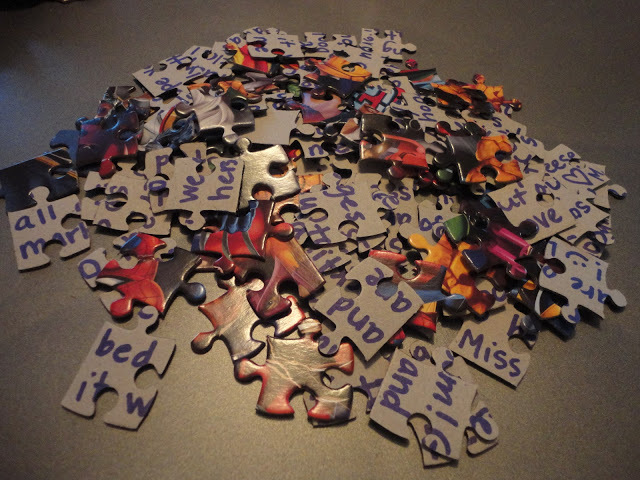 With swaps, you can send and receive jigsaw puzzles from all over the country. 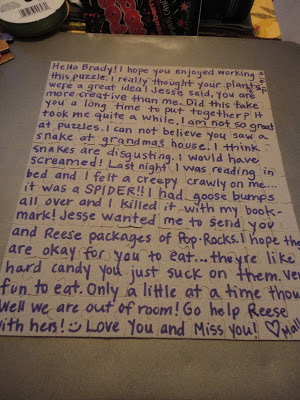 But recently we discovered Mallory's blog where she has put a new spin on puzzles in the mail. Mallory is a creative woman with a lot of long distance family. To keep in touch with the younger bunch and foster a close relationship with them across the miles, Mallory has found fun, interactive ways to communicate. One way she came up with was penpal puzzles! The concept is simple: she finds a puzzle that her cousin (or niece of nephew) would like (with an appropriate piece count for their age), she puts it together, then she flips it over and writes a note on the back. And voila! The kiddos get a fun new gift, an educational and interactive activity, and a letter to cherish from a loving family member! The same thing could work for adult family and friends, though it might take you a little longer to accomplish! It would make an additionally wonderful gift for grandparents using a custom jigsaw puzzle with a beloved family photo.